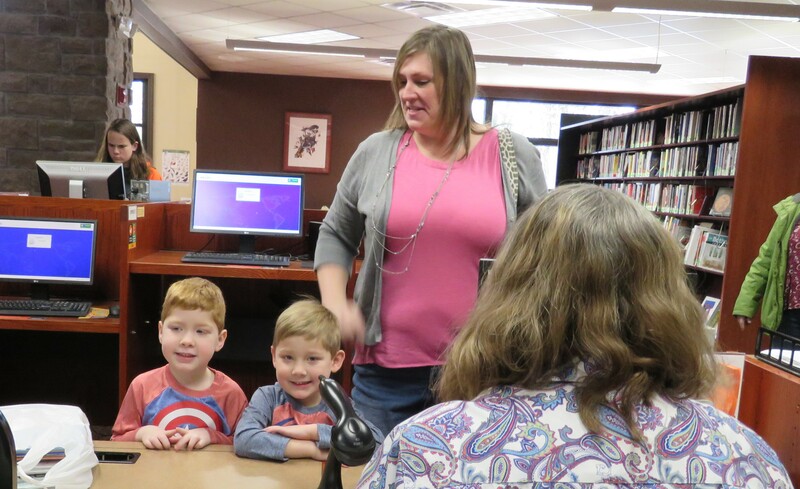 Jacob Curley and Joe Curley get their library sticker from Ms. Patrice at the Powell Branch Library as their mom looks on. The Powell Branch Library may have seen bigger days, but it’s hard to say when. On Friday, the library blended dozens of little kids and their families for a birthday party for Dolly Parton, the inspiration for Imagination Library AKA “the book lady,” mixed in a busload of seniors from Morning Pointe Independent Living, sprinkled with folks who were tired of being cooped up all week by weather. Let’s just say the parking lot was full, the cupcakes were joyous and the lines were long at the checkout counter. The library issued a new, butterfly-themed card for the event, and Friends of the Library sponsored the party refreshments and games.